Among their billions of records, Ancestry.com has various record sets specifically concerning Irish genealogy in the U.S. and Canada. 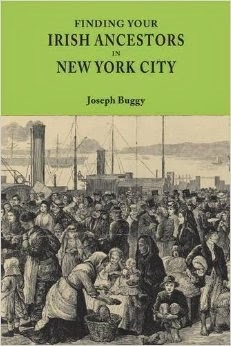 I have previously highlighted Chicago Irish Families, 1875-1925, and today it is the turn of Irish Canadian Emigration Records, 1823-1849. This database consists of records from two emigration agents, James Allison and A.J. Buchanon , and comes from records housed at Library and Archives Canada. It is a very important record set as the official recording of immigrants coming on ships to Canada did not begin until 1865. While there are substitutes, such as this record set, in most cases passenger manifests from before 1865 do not exist for Canadian ports. Allison's records, from a larger set called the Nielson Collection, consist of letters, petitions, reports, and about 75 pages of lists of names. There are mostly Catholic orphanage records in the Buchanon collection. Information can include name, date of admission, age, whether boy or girl, state of health, date of death, names of adoptive parents, name of ship arrived on, destination, and arrival date. Don't discount that your Irish ancestors in the U.S. might have come to the continent via a ship to a Canadian port. Passenger fares to Canadian ports were not as expensive as New York and Boston.